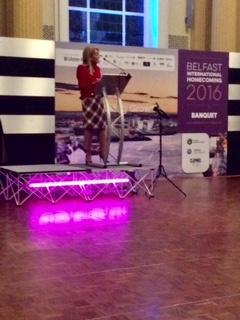 Klin’s Chair, Marie Macklin, was recently the guest of Belfast International Homecoming Business and Investment Conference 2016 in Belfast. 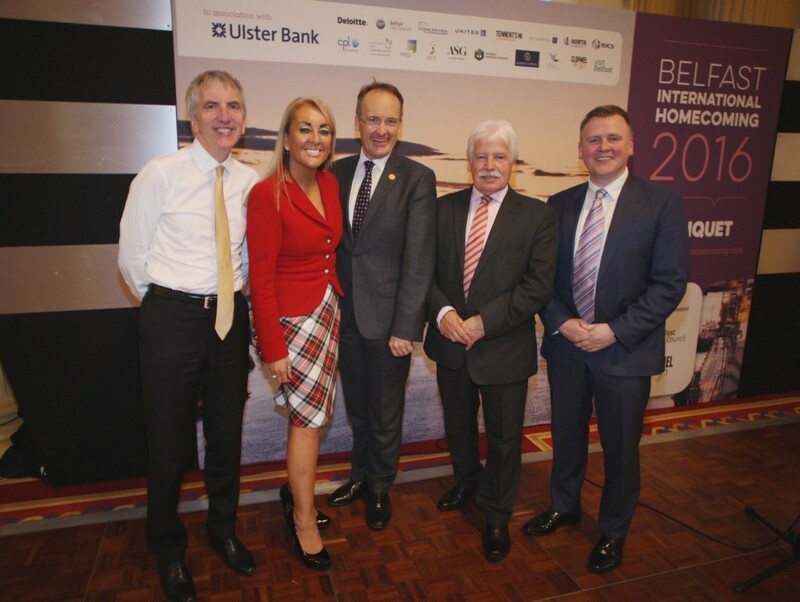 While in the city she met with the Lord Mayor of Belfast, Alderman Brian Kingston, and Northern Ireland’s Finance Minister, Máirtín Ó Muilleoir, and presented the awards for Northern Ireland’s Top 50 companies. Addressing the Conference audience, Marie told them of her “gold dream” to see an aspirational, entrepreneurial society in Northern Ireland with opportunities for all. Marie told the audience of her belief that opportunities result from collaboration, partnerships and friendship and her certainty that Belfast has the opportunity to deliver its own gold Dream through building on its international reputation and the foundations that were laid by its forefathers. Citing Harland and Wolf, Mackie Engineering and the 32 linen mills that existed in Belfast in the mid 19th Century, Marie drew parallels between Belfast, Glasgow and her home town of Kilmarnock, stating that they were all at the forefront of the first Industrial Revolution. “In this, the 21st Century, a fourth Industrial Revolution has dawned – the Digital and Cyber age. This, accompanied by emerging markets, is where I see huge opportunities. “The first Industrial Revolution used water and steam power to mechanise production. The second used electric power to create mass production. The third used electronics and information technology to automate production. Now the fourth Industrial Revolution is building on the third, the digital revolution that has been occurring since the middle of the last century. It is characterised by a fusion of technologies that is blurring the lines between the physical, digital, and biological spheres. “The possibilities of billions of people connected by mobile devices, with unprecedented processing power, storage capacity, and access to knowledge, are unlimited. “The fourth Industrial Revolution has the potential to raise global income levels and improve the quality of life for populations around the world. And with the talent and vision I see here in Belfast, I truly believe you will be at the forefront of this revolution. Marie was adamant that the private, public and third sectors need to work together – to collaborate – to beat the challenges that face a post Brexit United Kingdom. “With this in mind I refer you to the Belfast Chamber of Trade & Commerce who recently launched their Belfast 1st Manifesto. Built around five core policies, it aims to make Belfast a self-governing city; improve access and infrastructure; grow the city’s position as a world-class tech city; promote fairer rates and taxes; and reinvent the city centre. She referred to the economic strategy being put forward by Northern Ireland’s Finance Minister, Máirtín Ó Muilleoir, based on the themes of: infrastructure, business architecture, skills, education, environment and entrepreneurship. Marie outlined to the Belfast audience her recently announced plans for the HALO Project in Kilmarnock, to be built on the site of the former Johnnie Walker bottling plant in the town. The HALO Project will be run as a community led urban regeneration project in partnership with East Ayrshire Council and Diageo and see the rebirth of the site in the centre of Kilmarnock. Marie went on to announce her own dream of a HALO development for Belfast. 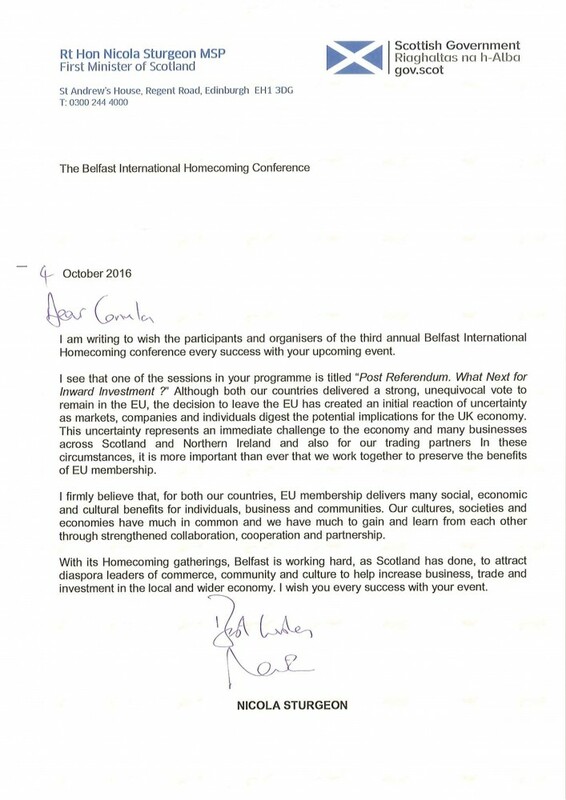 She delivered and read out letters to the Northern Irish community from Glasgow entrepreneur, Lord Haughey, and Scotland’s First Minister, Nicola Sturgeon MSP (see separate posts), and applauded the Northern Irish Executive for its approach to re-energising the Northern Irish economy. “This is a listening executive delivering a robust fiscal policy to drive a revitalised economic recovery for every aspect of the communities and importantly for me Entrepreneurs who create employment opportunities,” she said. 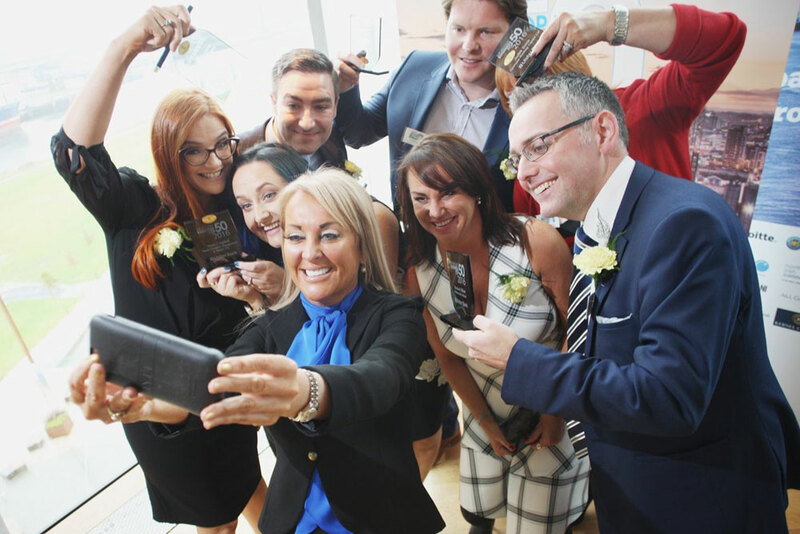 Marie told her audience of her belief that Belfast is open for business, with its own gold dream powered by a talented workforce with an entrepreneurial flair and its youth, whose hope, aspiration and belief is reflected in Young Enterprise Belfast.